The home of the Ajayis in Akure have been turned into a healing center, after they welcomed a baby called ‘Daddy Samuel’ who reportedly has healing powers. According to eyewitnesses, the two-months-old baby was born with a bunch of leaves bonded by a strand of hair, and was reportedly spoke two weeks after he was born. Though the parents of the baby had no evidence to back up their claim, however they insisted that the baby they almost aborted due to economic hardship in the upkeep of the three boys they had before Samuel, had a miraculous birth. 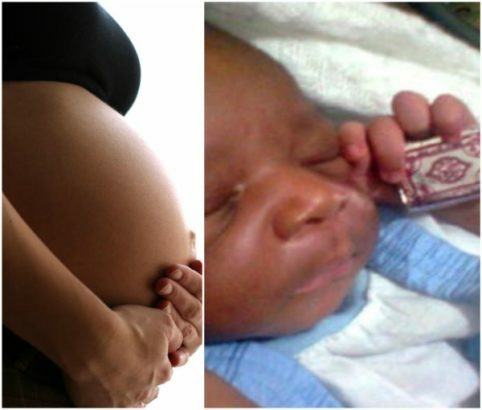 Speaking to NAN correspondents on the birth of the baby, Pastor Gabriel Oluwadamilare of Celestial Church of Christ (CCC) Shalom Parish, Ikorodu, Lagos State, said that circumstances that surrounded the birth of the new born baby also happened in the Bible. Also confirming this, one Maruf Akande a.k.a Alfa,who claimed to be the manager of the spiritual center where people are trooping in to see the miraculous baby, said he was baffled with the events surrounding the birth of the baby as no fewer than 300 people registered at the centre every day. Another worker at the venue, Mrs Aina Bello, said that her husband was a beneficiary of the ‘wonder boy’. “We have spent about N45,000 in different hospitals but the situation remained the same. Even some rejected him. But thanks to baby Samuel that God used to heal my husband. Samuel’s mother just told me, having received inspiration from baby Samuel, to give him sachet water and instructed me to give alms, which I did. According to her, since no money was taken from her, she volunteered to be a worker at the center. Another client identified as Bukola, who had a testimony to share with NAN correspondent, said she was at the venue because of her mother who had stroke. According to Bukola who said the stroke came upon her mother for a reason, said she believes her mother will be healed when attended to by baby Samuel.